For the past few months I’ve been rehearsing the newsletter I planned to send out with a belated apology for not writing and an announcement that I wouldn’t be writing here for the foreseeable future. Saturday though something shifted and I decided I’m not ready yet to completely let go of this project that will soon be celebrating two years in the making. I started Memoir of a Meanderer when I was still dreaming of quitting my day job and making my way as a full-time travel blogger. I knew little about what it would take to profit from writing, but I knew I needed to write more and having a public space to share my thoughts seemed like a good way to start. And now that I’ve found my way to Western North Carolina, (most days) I think of settling in somewhere, finding stability, having a family of my own. I planned to abandon Memoir of a Meanderer to focus on writing more seriously. I want to write a real memoir, not just a series of blogs. I have half a dozen essays in mind, waiting to be written and sent off for possible publication in magazines or literary journals. I thought if I stopped writing here I’d write elsewhere. So far, not writing here has meant not writing anywhere. I plan to change that, starting here, now. I’ve long loved taking photographs. I remember my first camera– small and pink with a black wheel for winding the film that clicked as I spun it with forefinger and thumb. One of my aunts owned a Polaroid camera in the days before digital when instant photos were magic. Sometimes she’d let me borrow it and I’d run around snapping photos and waving the squares in the air until the white fog dissipated and gave way to an image. My parents bought me a camera with an adjustable lens and a full body for my high school graduation. I carried it around with me, finding beauty in every day life. I filled film with photos from sidewalks, street corners, and city parks. To walk with a camera in my bag was to see the world in a new way. I studied the details of my surroundings, contemplated angles and sunlight, stood tall, crouched low, and stalled in one spot for the perfect shot. The camera traveled with me on my early adventures to Paris and Germany, allowed me to later fill scrapbook pages with professional-looking photographs. I resisted a digital camera for as long as I could. I loved the camera I got for my graduation. I loved having one chance to take the perfect picture and not knowing for weeks or months while I finished a roll of film and waited for the pictures to develop whether or not they’d come out the way I’d wanted. My then-husband bought me a digital camera one year for Christmas. It was small and square and could fit in my pocket, but could zoom from one end of the Boston Garden to the other to take a clear picture of the goalie at the other end of the Bruins game where I first tried it out. Had anyone else bought me a digital camera, I probably would have resisted it longer. Love makes us make exceptions. Before my road trip two summers ago when I was still considering the notion that I could be a full-time travel blogger, I decided it was time to buy a good camera. I spent hours deliberating in the camera shop near my house, asking the salesman dozens of questions before going home with notes and names of cameras. I spent days searching the internet for reviews and information before going back and making a decision. I settled on a Nikon that featured a fold-out, digital screen. It flips 180 degrees allowing me to let it face out or in. The screen turns and fits snugly into the base, making it look and function like the camera I fell in love with after graduation. I can look through the small, square lens to take a shot and resist playing the image back immediately, instead waiting until the end of the day to project the images on my computer screen. It’s the closest I can come to flipping through printed photos with excited anticipation in a Walgreen’s parking lot. When I first moved to North Carolina I carried my camera with me everywhere I went. Everything was new. Everything would make the perfect photograph, but when I returned home to upload a day’s photos to my computer, I saw that the pictures I took were far from perfect. My photos were cast in a constant state of darkness. For months I took pictures in bright day-light only to have them look like night-time shots. Colors were muted, black, dull. I changed the settings, tried the flash, used the backlighting option, but the changes only distorted the colors of a frame cloaked in shadows. I went back through old photos trying to figure out when things went wrong, when all of my photos started coming out dark. I noted how photos from Arches National Park, Utah were especially gray and thought maybe the sun had melted something. Sifting through the old photos though, I saw not a digression, but a sporadic jumping from light to dark. 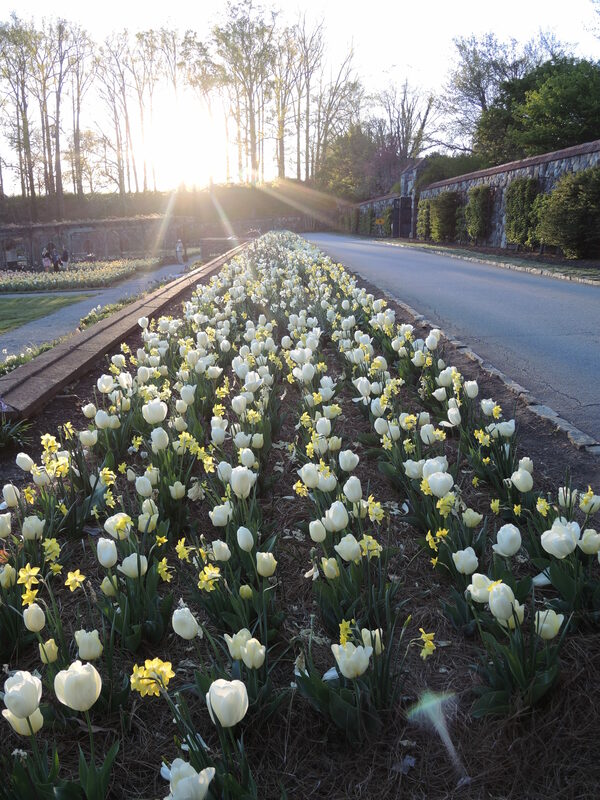 Savannah was in shadows, but the blooms at Biltmore earlier this year were bright as ever. I kept trying, kept carrying my camera around with me, but for months my pictures were drab versions of the world. I grew more and more frustrated. I stopped wanting to write articles here because none of the pictures I took to accompany them were worth posting. 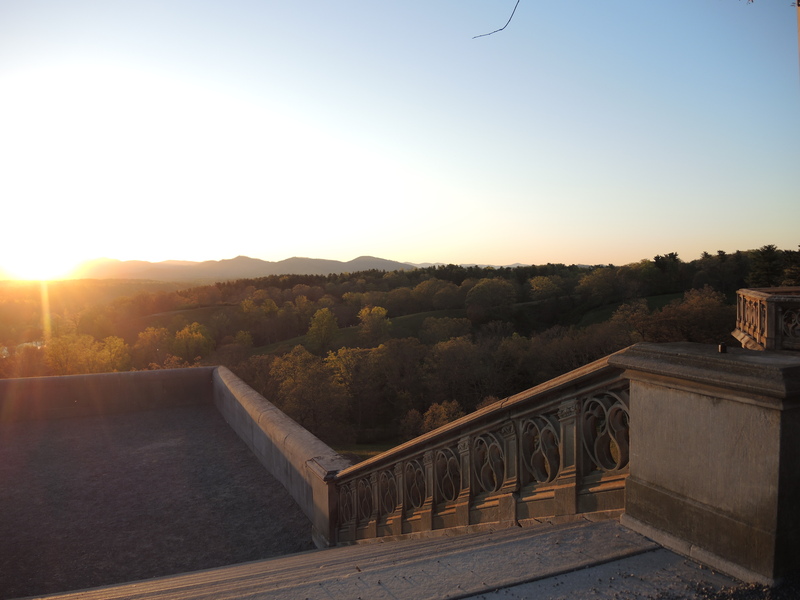 This past weekend I made a trip to the Biltmore Estate– by far one of the most beautiful landscapes in Western North Carolina. It’s spring time here and everything is in bloom. 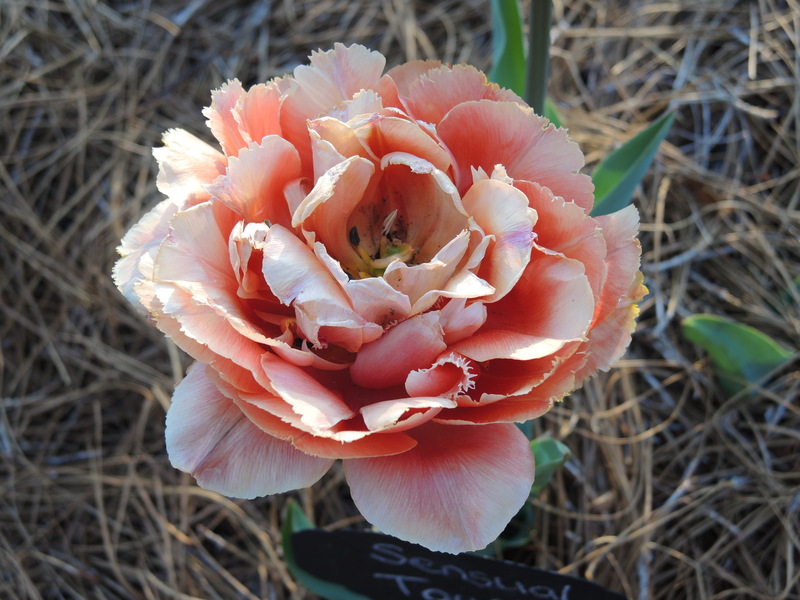 The gardens at Biltmore are bursting with rows of tulips, daffodils, and a various other colorful blossoms. 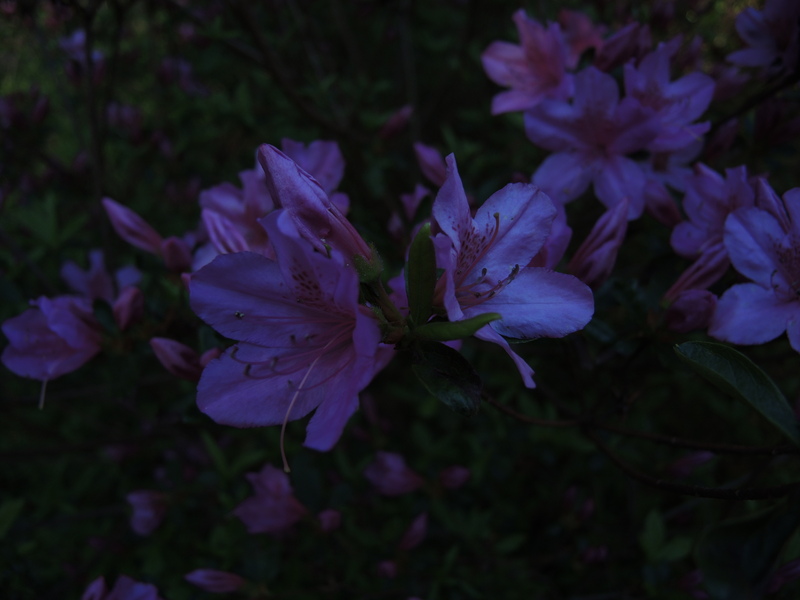 I brought my camera and spent an hour crouching down to capture the flowers on film. On the screen everything looked black. I thought it was just the shadow from the sun reflecting off the display. I found a spot in the shade, pressed the play back button, and peered through the clear lens. There was no mistaking the darkness that masked every one of the shots. I was dismayed to say the least. 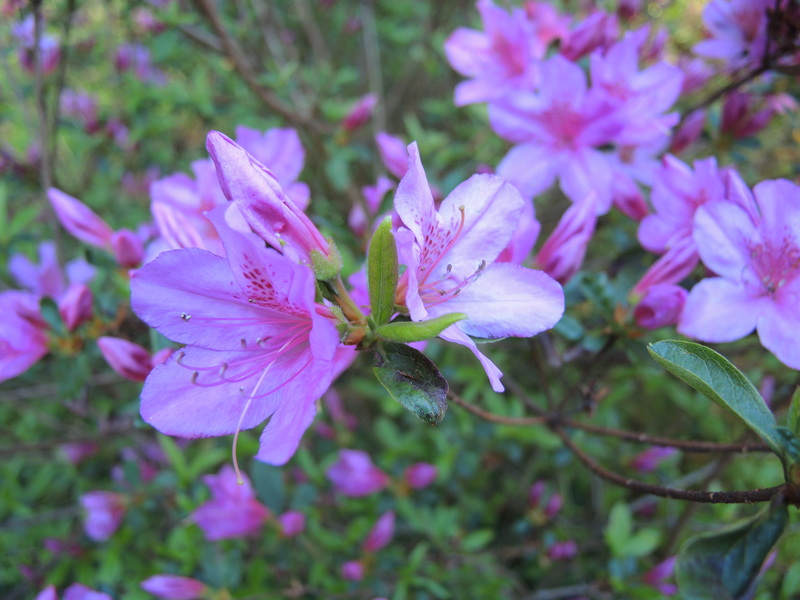 I continued walking through the gardens and stopped on a path by a bright rhododendron in full bloom. The sun was striking it directly, but in my photo it looked like twilight. I looked down at the camera in my hands and decided I wasn’t moving until I could lift the darkness from my photos. I stared down at the camera in my hands, contemplating every button, every option, every feature. Nothing on the face of it made any difference to the darkness. I shifted my focus to the top of the camera where there’s a dial to change the settings, a lever to zoom in or out with a button to release the shutter, and another to shut off the power. None of those gave any indication of darkness or light. Then I noticed another wheel to the right of the power button. A small one, covered in numbers from -3 to 3. I had never touched the dial. I had no idea what it did. It was set to -3 and a light beside it glared red. I took a breath and shifted it slightly. Nothing happened. I shifted it another place marker. Still nothing. I shifted it again and thought I saw a slight change in the light that shone on the digital screen. I turned it all the way to zero in one more motion and suddenly the image on my screen was a clear and bright as the world beyond my camera lens. I snapped a photo. The world was transformed. I have no idea why I rendered that third wheel untouchable. Why I hadn’t thought sooner to at least see what it might do. In an instant though, discovering its purpose, everything changed. I realized that I could control the amount of light my camera let in or closed out. The months of darkness were a result of inadvertently turning the wheel to the lowest setting. The shifting pattern of dark to light that I’d noted in the hundreds of photos I’ve taken over the past two years suddenly made sense. I must have been spinning the wheel by mistake as I carried it in and pulled it out of my purse. 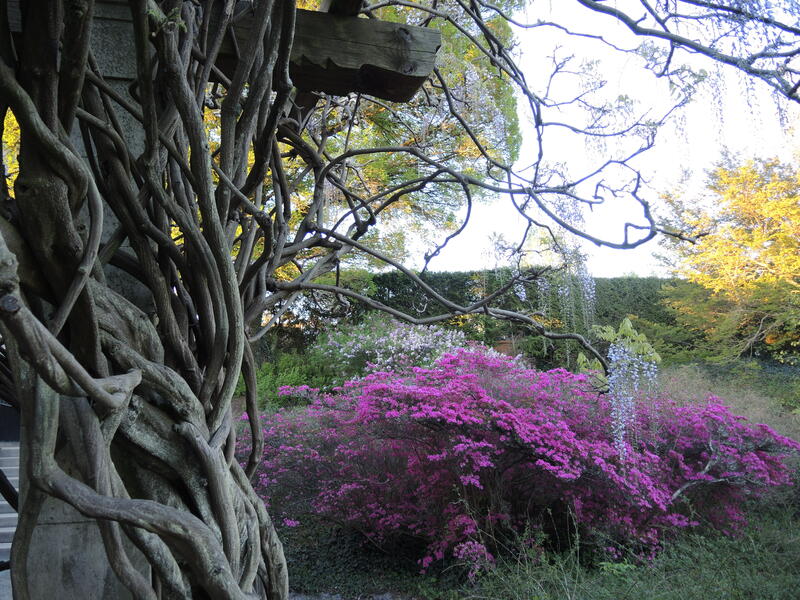 After the rhododendron transformation I ran back along the path I’d previously slumped down, back toward the garden, chasing the setting of the sun. I squatted down among the tulips and skirted along the stone steps of the estate, snapping photos, feeling the same magic I witnessed with each developing Polaroid that I’d waved in my youth. I’ve decided I will no longer write my apology newsletter. I will no longer abandon this blog. Though I do plan to write more elsewhere, I’m not ready to completely give up on this site. This weekend I was reminded of how sometimes the simplest of things can cause a major shift in perception. 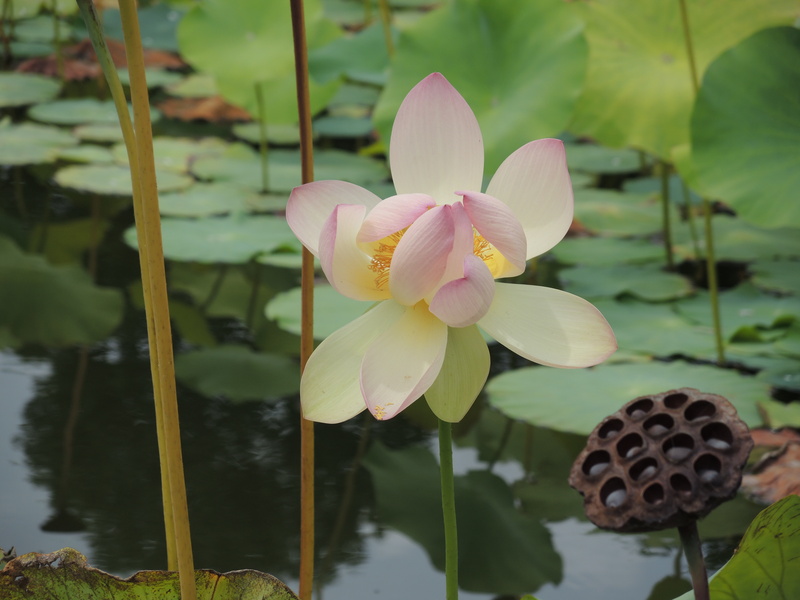 How sometimes in the pit of our dissatisfaction we overlook the one thing we need to bring light to the darkness. Sometimes a new beginning is a simple as turning a camera wheel in the right direction.